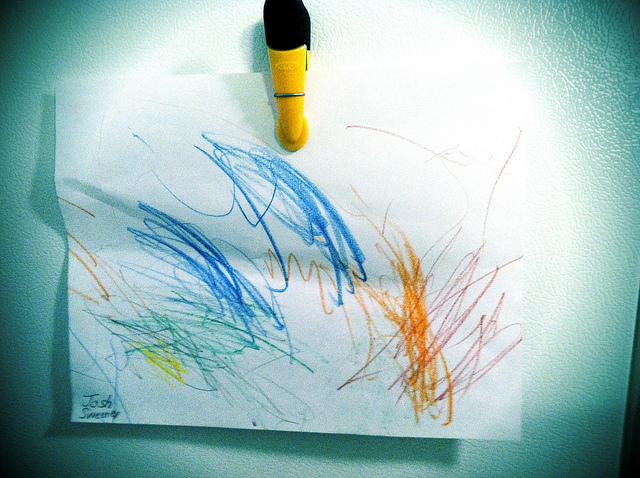 Josh’s First Fridge Art by Jessica, licensed CC BY-SA. When kids are little, we are quick to share their works, without worrying if they are worthy, or if sharing gets in the way of the creator’s growth. A first scribble hung on the fridge engages its crayon-wielding artist in community, audience, and their own creative evolution. I still remember my first daughter’s prolific Blue Period, quickly far too large for her limited fridge gallery. Yet as soon as kids enter school, their work descends into an underworld of assessment: kindergarten’s finger paintings give way to worksheets, reports, and standardized tests that fall quickly to their final, lonely resting places, giving off the dying breath of grades. In a previous post on an “electric” metaphor for renewable experiential and applied learning (REAL), I suggested that renewable assignments—assignments where students produce meaningful, public works—store value like batteries, not only for their creators, but also for future learners and the community at large. What makes an assignment renewable? A renewable assignment should be meaningful beyond its role in learning and assessment. This is the simple power of experiential learning: when an assignment engages a learner and their work in the larger world, it provides opportunities for learning that go beyond mere graded exercises. But experiential learning—easier said then done! How can a learner take first steps in the larger world when that larger world is made out of expensive materials that specifically prohibit contribution, modification, and republication? Truly renewable assignments engage learners in open materials—openly licensed or in the public domain—so that learners are free to take small, first steps, and increasingly larger strides, to contribute to and modify meaningful works, and also republish their contributions to put real experience in their learning. Artifacts produced by open, renewable assignments store the engagement of each learner—not only so each learner can build on their experience, but also so others can too, “renewing” the assignment again and again.